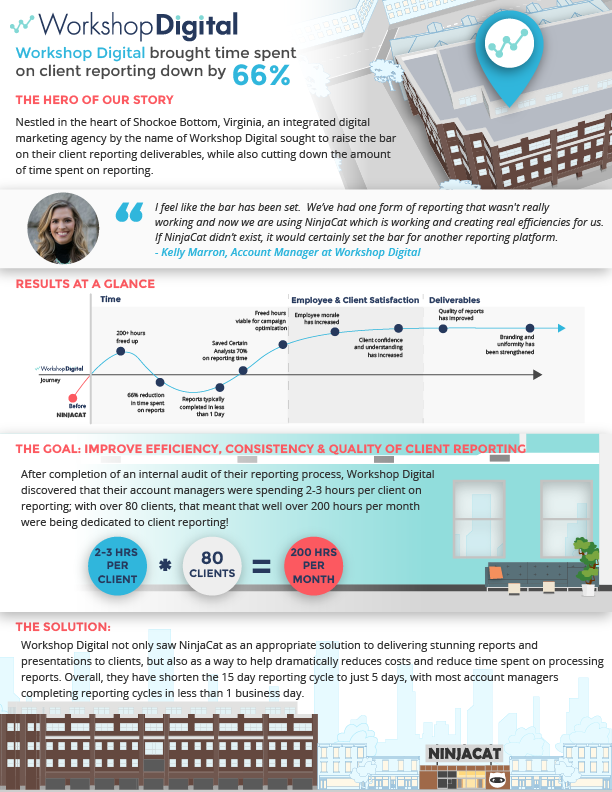 Nestled in the heart of Shockoe Bottom, Virginia, an integrated digital marketing agency by the name of Workshop Digital sought to raise the bar on their client reporting deliverables, while also cutting down the amount of time spent on reporting. Workshop Digital offers SEO, Paid Digital Marketing, Social Media and Content Marketing. Prior to adopting NinjaCat, consistency and efficiency were suffering. Reports were created using several disparate platforms, which led to inconsistency in the timeliness of report delivery to clients. The creation of full custom reports robbed account managers and marketers of valuable hours which could be used to further optimize accounts. 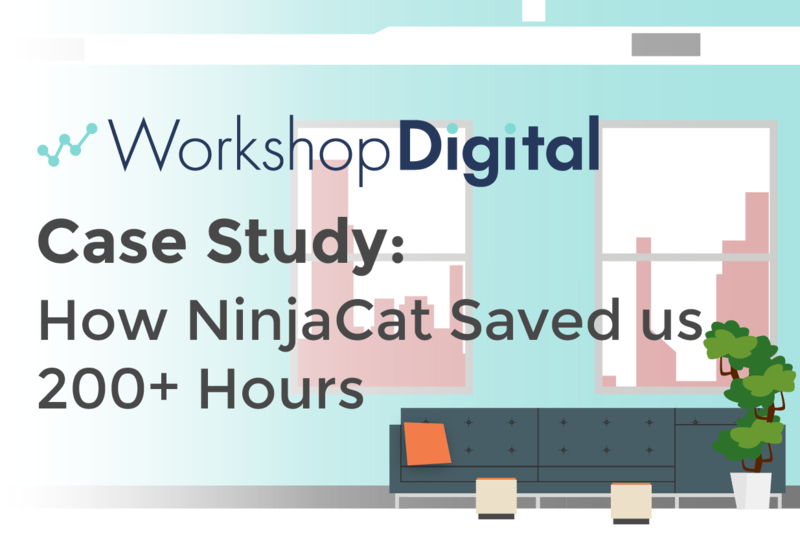 Prior to NinjaCat, Workshop Digital was utilizing a large PPC management platform. It soon became an expensive, unnecessarily robust solution that ultimately did not deliver upon the reporting expectations Workshop Digital required. What they found was that they were paying a large premium for management features they were not utilizing, while their biggest pain points were actually related to client reporting and monitoring; an area where NinjaCat far outshined at a more affordable price. After completion of an internal audit of their reporting process, Workshop Digital discovered that their account managers were spending 2-3 hours per client on reporting -- an easy task if they only had 3 or 4 clients to report on. However, Workshop Digital has over 80 clients, which meant that well over 200 hours per month were being dedicated to the sole task of client reporting! Workshop Digital reacted to the internal audit with swift action: a new reporting solution needed to be implemented. Soon thereafter, they rolled out NinjaCat for 80 of their major clients, freeing up almost an entire months worth of time across their account management and optimization teams. The results have been dramatic. Overall, Workshop Digital has been able to shorten the 15 day reporting cycle to just 5 days. Workshop Digital feels their new reports and dashboards give a true and cohesive representation of the caliber of work they deliver to clients. This has led to not only more insightful communication of marketing campaigns with their clients, but also has led to the improved ability of showing clients Workshop Digital’s value in maximizing budgets for larger campaigns in the future. The most welcomed effect of implementing the NinjaCat client reporting solution has been improvement of employee morale. The dreaded reporting process is a thing of the past for Workshop Digital! Workshop Digital not only saw NinjaCat as an appropriate solution to delivering stunning reports and presentations to clients, but also as a way to help dramatically reduces costs, reduce time spent on processing reports, improve the Agency-Client Relationship and take their reporting cycle from 15 days to 1 - 5 days, with most account managers completing reporting cycles in less than 1 business day. Sign up for our quick demo today, and allow us to show you the full potential of Ninjacat, the all-in-one reporting and client management solution for digital marketing agencies worldwide. Workshop Digital sought to raise the bar on their client reporting deliverables, while also cutting down the amount of time spent on reporting.